Just like with your pool, maintenance is a top priority when it comes to landscaping. There are actually two types of maintenance you need to keep in mind. The first is maintaining the plants. Make sure that you have access to them for watering, trimming, and other necessary activities. The second is how you’ll maintain your pool. Flowering plants and trees and their proximity to the pool can lead to extra work keeping debris out of the water. While saplings and other young landscaping features may seem small as they are planted, you need to take into account the size they will reach 1, 5, even 10 years down the road. Your landscape design should consider the plants full size in relation to the edge of the pool. This can prevent potential damage as it grows, as well as overhang in terms of shade and debris. While we mentioned the size of your landscaping above ground, how it grows beneath the surface is also important. Plants with aggressive root systems, like river birches and willow trees, can have an impact on your pool. Your pool can also have an impact on your plants. Some plants can be affected by salt; so if you have a salt chlorinating system, the proximity of these plants to your pool can influence their health. Trees should be planted at a safe distance from your pool. Of course, the sun plays a significant part in the enjoyment of your pool. It’s also important for the health of your landscaping. Understanding where the sun is and isn’t based on the location of your house, the direction of your pool, and any existing or planned landscaping is key. The pattern and path of the sunlight will help you determine what to plant and where. Landscaping is an essential part of maximizing your pool’s aesthetics. Whether you are planning on freshening up around your existing pool or planning on building a pool this spring, the experts at Lucas Firmin Pools can help. 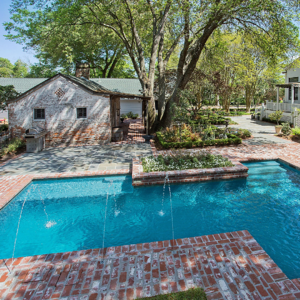 Lucas Firmin Pools builds and maintains custom pools in the Baton Rouge area.